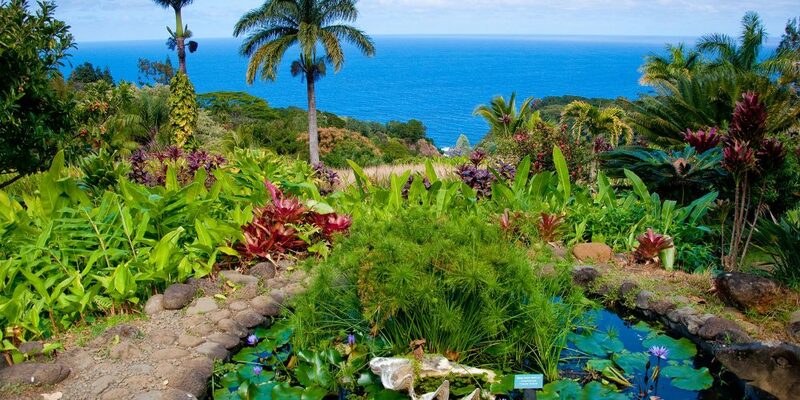 Our garden is nestled on the slopes of the mighty Haleakala, a dormant volcano responsible for the formation of East Maui. This dry, temperate climate is a perfect location for growing protea flowers. Many members of this exotic plant are displayed in the garden. Originally from Australia and South Africa, these flowers are now grown here in Kula and exported all over the country. Most members of this species flower in winter (from December through April). A prominent feature of the garden is a gentle stream meandering through the valley. 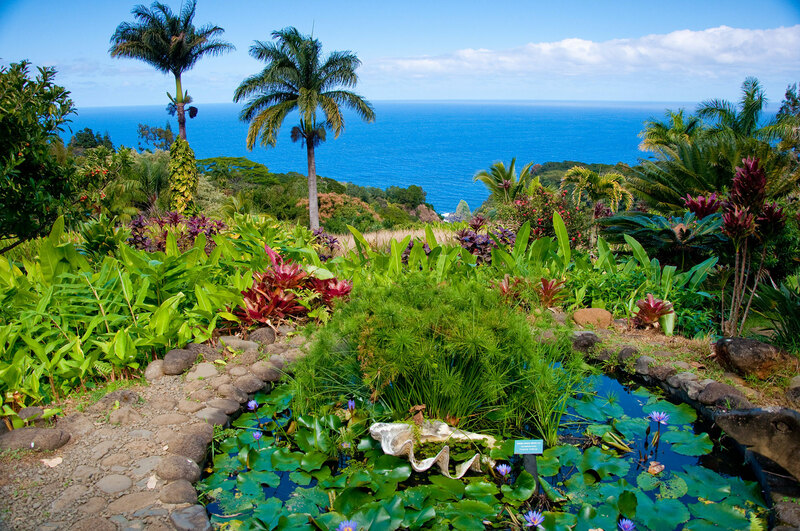 Many water-loving plants are diplayed here including a grove of fragrant White Ginger which blooms during mid to late summer. Another lovely part of the garden is a grove of Painted and Lemon Eucalyptus trees with Monstera huddled beneath them. Other attractions include an Orchid house (blooms from February through April), Fuscia House (blooms in summer), Bromeliad House (various varieties flower throughout the year), and a Bird Sanctuary for the endangered native Nene bird. Of course there are annual flowers and common bedding plants interspersed for color, but our garden was designed with a Botanical focus that continues to govern the plant selection and placement. Therefore, many plants are neither colorful nor “showy”, but selected for their educational potential or to preserve native specimens. Annual passes are available for those who would like to return again and again to enjoy the changing seasons and tranquility of this special place. We hope that you, too, will appreciate our garden and the legacy it carries .